The success of the 5/3/1 Method has been nothing short of extraordinary. For the past year, the response towards this simple but brutally effective training system has been overwhelming. This is because it works. And works for just about anyone willing to put in the discipline and work that getting stronger requires Elite level lifters to absolute beginners have all used the 5/3/1 Method; the basic tenets of strength training have and will never change. Big exercises, constant progress, and personal records will never go out of style. High school and college coaches are now using the 5/3/1 with their athletes with amazing success; it is easy to track, implement and will inspire any team to push for themselves to the limit. Powerlifters use this program, for both raw meets and geared meets. 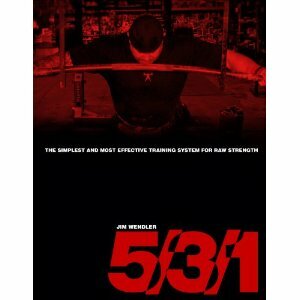 Long time Muscle Head Jim Wendler has put together a useful and dare I say needed publication for novice and intermediate lifters. Though I do agree with %75 or more of the 5/3/1 system I was more than a little disappointed with the lack of reference and or substance in regards to the science! On reading this publication I feel Jim was trying to be "anti-Intellectual" to make his case seem more hard-core. I find that a bit childish and hollow for someone with so much to offer. My quick capsule overview 5/3/1 is a very useful publication for a beginner and of marginal use to anyone intermediate and above.